It took me six months, two bottles of vinegar, and one sketchy transaction with carny hipster to bring her home, but she is finally here. And I did it myself! Between the installation, the cleaning, the collecting and assembling of all the crystals, I have a new appreciation for anything with dangly prisms. Chandeliers in particular. Technically, there are holes for TWENTY THREE more prisms but I think that might be overdoing it. 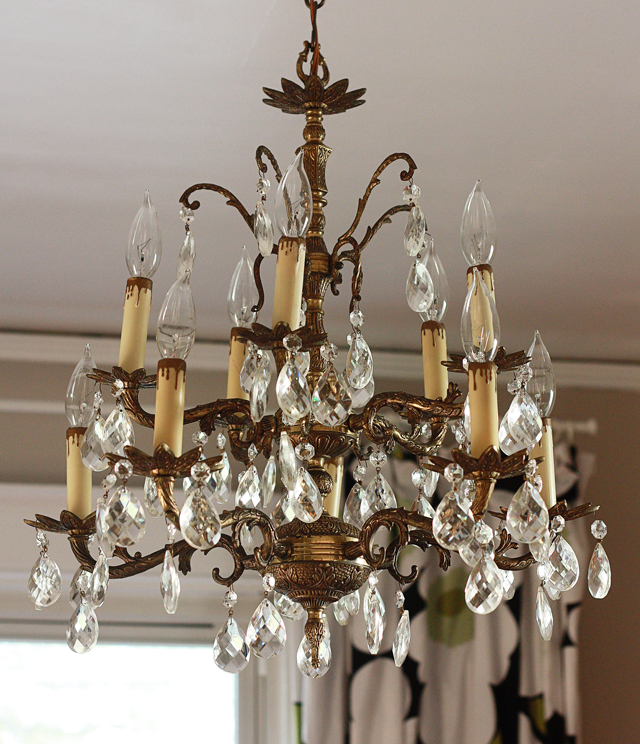 I have been lusting after brass and crystal chandeliers ever since I saw Pollyanna as a kid. There is a scene where Hayley Mills brings calves foot jelly to the poor folk ( I know, right? ), including Mrs. Snow, a crabby old woman on her deathbed. When Pollyanna disassembles her lantern and dangles the crystals in the window, Mrs. 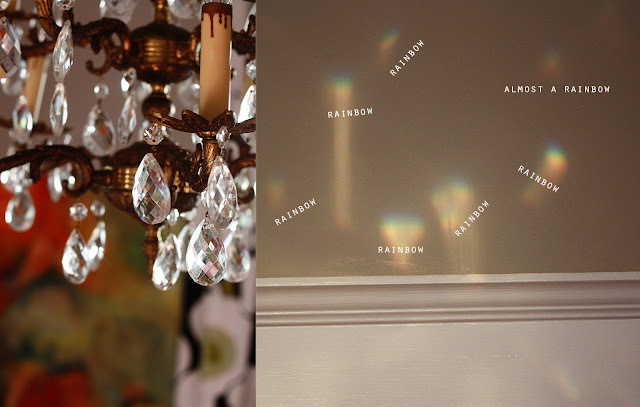 Snow suddenly finds herself in a room full of dancing rainbows. Note: This is where my chandelier, Mrs. Snow, got her name. I like to name things when I know I will be seeing them everyday for many years. It reminds me to take care of them. Also Note: As an adult, I now realize most poor widows on their deathbeds do not keep chandelier lanterns in the bedroom, and even if they did, calves foot jelly might not be the helping hand of choice. But it all seemed very logical at the time. And Hayley Mills has a way of presenting things as Gospel. Which is weird because my Dad told me she grew up and became a Hare Krishna. He even said he saw her sitting on the floor in an airport wearing an orange robe and playing a sitar. Then again, he also said he said hotdogs grew on trees. So there is that. If Mike and Toni’s Chandelier Galaxy was a real place, I would probably try to get a job in the stockroom. My cousin John came for a weekend in February and showed me how to do basic electrical work; replacing light fixtures, installing dimmers, etc.. Mrs. Snow was still under construction then, but John was good enough to take down the heinous ceiling fan and made way for a temporary Elmo lamp. (Yes, Elmo lamp). By the time he left I was on such a This Old House high, I took on repairing my own garbage disposal. Then last weekend Dale, who knows about these things, inspected the wiring and said Mrs. Snow looked sound enough to hang. It took three attempts, serious patience, two trips to the hardware store and a lot of help from Kiki, but I did it! This is my second proudest home improvement movement to date (the garbage disposal is still #1 as it was way too gnarly to rank #2). Snag: Mrs. Snow’s ceiling plate cover was too small and flat to fit over the junction box, so I had to buy a new one. Apparently Home Depot sells 150,000 items, but brushed brass ceiling plates isn’t one of them. So instead I bought the cheapest one they had in stock and decoupaged it with red origami paper. Neato, huh? 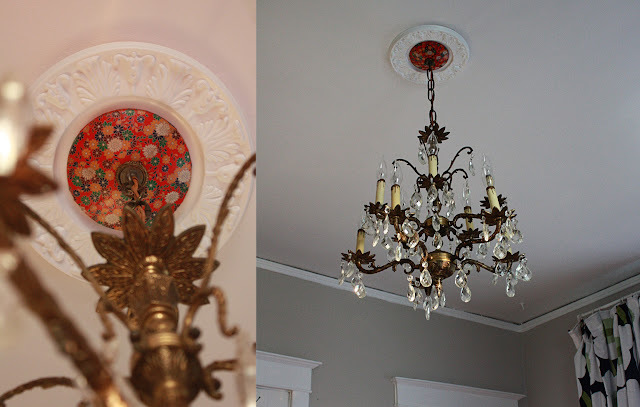 Thinking about installing a chandelier in your home? Here is a basic rundown. 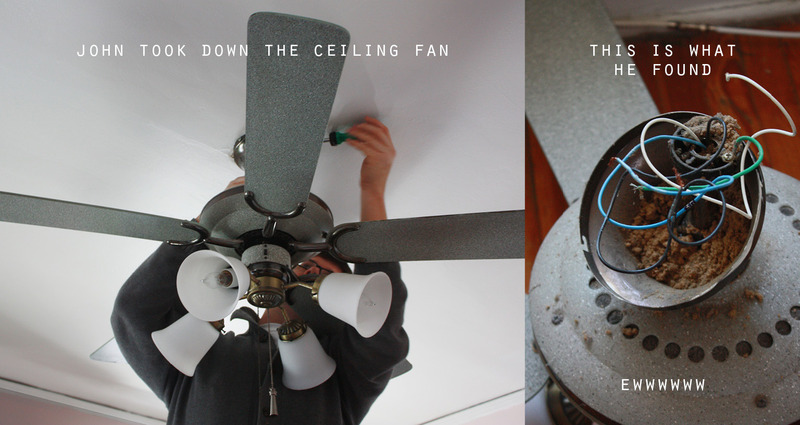 Warning: not all ceilings can handle the weight, and not all junction boxes will pair with older hardware (at least without some helpful advice and a couple trips to the hardware store). Want to see the crystals scene from Pollyanna with Mrs. Snow? Click here (FF to 3:30). Or hell, why not watch the whole movie? **Sigh** I LOVE IT! Thanks for sharing…re the solo cup thing…Won’t last. It looks fabulous. 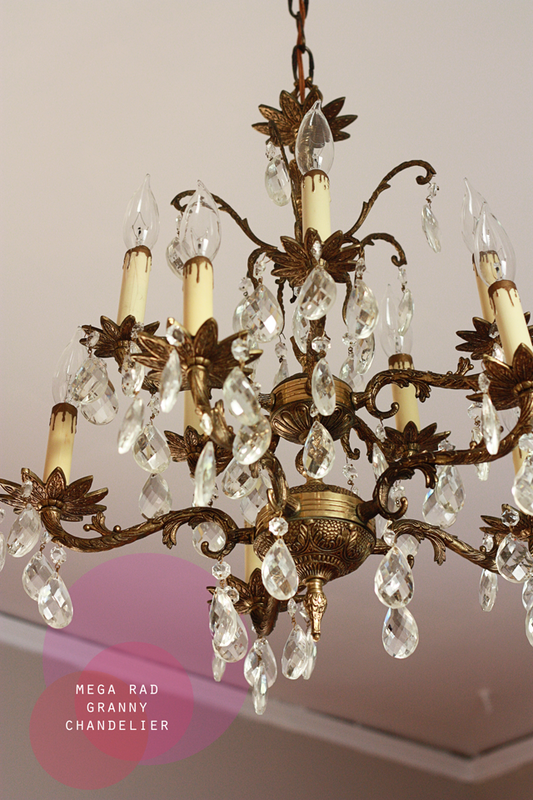 Brass and crystal chandeliers are my favorite. I’m so glad you didn’t shabby chic it and paint it white. Looks very classy! It must be lighting day around here (oh hell when isn’t it lighting day in my brain?) because I’ve got the Tord Garland light on my mind. Love that you’re showing off your decor and your home 🙂 keep it coming please! WOW! So lovely and impressive! You go Aunt Peaches! Love, love, love the way you solved the ceiling plate dilemma! You’re so creative!!! Well, I guess all of us will have to go a hunt to fill up those 23 holes. What’s interesting is that we can buy colored ones, and you can change them according to whim. This is in the living room, right? What’s in the kitchen? An upside down cake? your house makes me happy. Beautiful! And I love anything to do with Hayley Mills (Parent Trap!!!). Many years ago she came into a restaurant I worked in and they let me serve her even though she was not in my station. There was nothing Hare Krishna about her. NOTHING. Oh how lucky you are, Elahnah! One time I got to serve Ray Liota and I thought that was special, but Hayley Mills, OH MAN — you win! right now the kitchen has a fish basket light in the works… but that may change this weekend. I am looking at polyhedrons…stay tuned! I am having confused swoonitis because I can’t decide which is better, the chandelier or the funky red plate cover thing. Because the chandelier is AMAZING, but the red origami-paper-covered plate cover thing is… ALSO AMAZING!!! “Ya gotta getta chandeliah!” Har har.